To do: Watch this video to learn how to price your services and be sure to watch until the end where we reveal the best method to choose. Now that you’ve watched the video, read the important text below to learn all the different options of how you can price your services. Pricing is the most common question new planners ask. Ask yourself what you think you are worth and decide on a set hourly rate. The amount of experience you have will play a role in your decision. A common hourly rate can fall within $25/hr for a new planner, and go upwards of $100+/hr for top event planners with amazing portfolios. Typically you can charge about 30% more for a corporate event than a social event. Adjusting your prices based on the market you are serving (social vs corporate) is an acceptable practice. Charging a flat fee is the most common and preferred method of billing your client. With a flat fee, there are no surprises to you or your client. Once you discuss the fee amount with honesty and transparency, you and the client can focus solely on making the event as great as possible. When you outline your flat fee it is normal to charge a fee for your services, plus a percentage based on the total vendor fees. A standard vendor commission percentage fee is 10-15% so for example if a caterer charges $3000 for an event, your fee would be $300-450 for locating and coordinating that particular vendor. The above fee structure goes for both social and corporate events. In order to protect yourself financially, it is recommended to receive a 50% deposit upfront, and the remaining 50% within two weeks of the event. To calculate what your flat fee will be, you should make your best estimate on the number of hours you will put in toward the planning; plus any expenses you will have like gas, printing, supplies, equipment, etc; plus build in a 10 – 20% buffer in case the scope of the event goes over the initial details and this can be your flat fee that you charge. 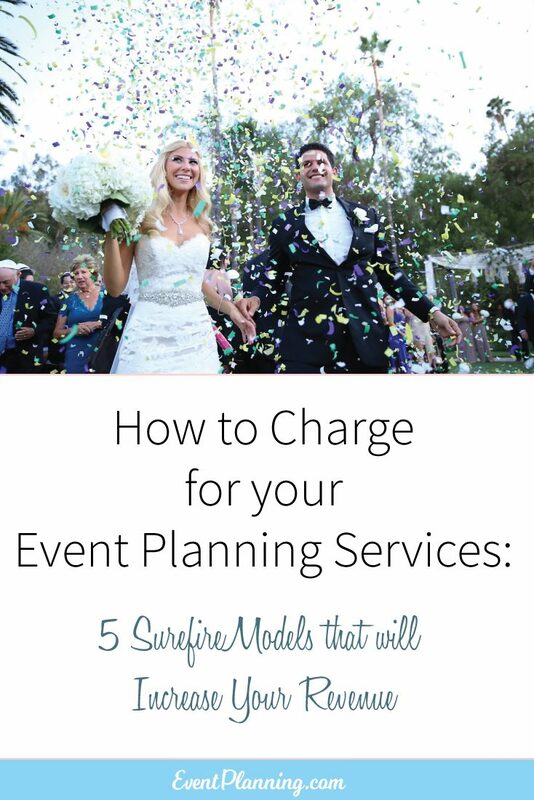 Some planners prefer to charge clients a percentage of their total event budget. The biggest difficulty with this method of charging is to present it to your client in a way that they will approve it. If you think you can run this by them without the client questioning your billing method then this is a possibility you should consider. Typical percentage amounts are 15 – 20% of the event budget. You can adjust it lower if you feel necessary. At some point in your career, you will be asked to do a day-of coordination. These typically happen for weddings but sometimes for special events too. When a client wants to hire you for day-of service, it means they have chosen their own vendors and work with them directly while you come in on the day of the event to make sure it runs smoothly. You can charge either by the hour or a flat fee for day-of coordination. You should assume 8 – 10 hours of work on the day of the event (multiply that by your hourly rate to get a flat fee), but do not forget the preparation you will have to do. We like to say you should prepare for at least one month to familiarize yourself fully with all aspects of the event you are coordinating. The extra preparation prior to the event may take you an additional 10 – 20 hours so be sure you take this into account when figuring out your fee. Since day-of coordination events are less expensive for the client, they have grown in popularity in recent years due to a slower economy. So even if you do not anticipate pitching this service, you may be asked for this by a client. A minority of planners choose to either heavily discount their client fees or charge nothing for their service, and make all their money by taking a commission from the vendors they hire. This method of billing has some supporters and some who dislike it. Those against this method say that you are doing a dis-service to your client by selecting vendors who are not the best at what they do but they will pay you the highest commission. Supporters of charging a commission say they still select the best vendors they know, but they just go the extra step to work out a commission structure. We would recommend against using this method unless you are 100% transparent with your client about what you do. It may be a tempting way to undercut the competition but overall it will leave more clients questioning your vendor selection than not. By being transparent with your client like in method #2 above, you can better serve your client. There you have it – the five most common ways to charge for your service. If you would like to read more about starting your own business you can do so here. Don’t forget to closely monitor your total overhead costs at all times. Overhead costs are made up of all non-labor expenses you have that are needed to put on the event. For example things like additional phone bill costs, gas expenses, hiring temporary help, etc. These overhead costs can be easily overlooked and often make up about 4 – 5% of the total event budget. So be sure to monitor these and incorporate them into your pricing. If articles like this are helpful to your event planning, you will enjoy our full "Become an Event Planner" course. For a limited time you can try the full course for only $7 (regular price $295). This limited time trial includes much more detail on how to price your services, proposal samples, 23 free bonus templates, and contracts; as well as 11 modules and weekly projects to help grow your business. Click here to take advantage of the limited-time deal for only $7. Receiving deposits – We recommend you receive a 30 – 50% non-refundable deposit at the time of signing the contract. And the remaining portion two weeks prior to the event. Decor charges – if you also do elaborate decor for the event you can charge extra for it. If you do not view decor as an extra specialty you offer then just charge for your planning services as usual. If you found this article helpful please share it on Facebook. Hello my name is Benjamin, I’m a student at Antonelli college studying Hospitality Arts. I’m trying to becoming an event planner in Cincinnati Ohio. Hello, my name is Christina, I am not a student at any Hospitality Arts. But I am currently taking Business Management. I am also very interested in becoming an event planner. Excellent thorough article. I price my events like in #2 and have had success with that for over 5 years. Thank you for this info. I combined this with the email you sent on pricing which is really good. This article gives me a good general idea what to charge my clients and others. Hi Denise, Glad this is helpful! Be sure you read the additional tips on how to maximize your income in the Day 3 email in our Free Mini-Course. This is a very thorough analysis with a lot of good options. I’m leaning toward a hybrid but option 2 makes a lot of sense for me to charge. Thanks twas really helpful. I’m a childminder but found out that I do have fun planning events. I’ve been doing it voluntarily for sometime but now I feel like going into the business of events planning. Thanks for your guide. Thanks all the questions I had are being answered. Hi I am an event planner at Chicago fm a local radio station. I want to learn more about event planning and this is good start. Exactly what I was looking for. I’m planning a combination of 2 of these strategies plus a day-of option. I want to go in a somewhat different direction and would like comments on pricing. I do not want to start an event planning business but rather an event designer. I do not want to plan the event but only decorate it. For weddings it has typically been the ceremony space with pew markers, entrance arrangements, and alter arrangements along with candelabras and arches which I also rent to clients. For the reception I will acquire and deliver what you want, make centerpieces, setup linens and head tables and sweetheart tables and then after event cleanup and pack up items. It has always been a hit and a miss when charging for my services. Any suggestions? Hi, I have my own Business in Event Planning, but I’m just getting started. I was wondering when the course is completed do u get a Certificate or some kind of Certification? thank you so much for lesson 3 which has really been helpful.with what i have learnt i think with a system we have here in my country i think vendor commission will be the best method to use.once you tell your client u have a service charge they might not give you the job again feeling they will get another event planner who will not charge them for that..so i feel having a vendor commission will be really helpful.looking forward to the final lesson. Thank you very much for this lesson. I am very much looking forward to day 4 and reading more material. Thank you for the video & answering my questions. I look forward to more videos!!! I think there is only one model missing, sometimes wedding planners and venue finders will offer free wedding planning and wedding hall booking service as long as only a listed preferred vendors and other providers are hired for the event, so it sort of ‘stays in the family’. Question if I’m only interesting on decorating the event how is best way for me to charge for my services ? Thank you. I’m just starting my business and this article has been so helpful. Exactly what I needed to read and now I know how to charge. This article is of great help. I do not charge a percentage from my vendors, I charge a flat fee. In your opinion what do you think i should charge a client for 300 plus guests, If I am using 3 to 4 assistants on the day of. I live in Los Angeles how do you charge for destination weddings for example someone wants my services in the Bay Area. I have a degree in Hospitality Management from the University of MS and will be forming a LLC this year for my Event Planning business. This video was very informative. Even though I’ve been event planning for years, I’ve now decided to make it a full-time business. I absolutely love what I do. This article was extremely helpful because I wasn’t quite sure how to handle billing matters, I didn’t want to over or under charge. Thank you! Thank you for the information that you always provide. I just recently launched my website, and look forward to meeting new clients and fulfilling there event planning dreams . THANK YOU SO MUCH. I’M REALLY LEARNING A LOT! Thank you! This is exactly what I was looking for. I also bought your course today and LOVE IT!! So helpful and so good! Thank you for the information and tips, it is all so helpful. I’m creating my business plan right now, and I keep getting stopped at the “Pricing” section because I just did not know where to start, but now I do. So thank you! This is exactly what i was looking for. I’m really improving a lot through your articles. I have great passion for this business and I have plans to quit my job at a cellular phone company at the end of this year to start my own business as an event planner. I am reading everything you have and taking your course. Very thankful for your guidance. Did anyone have to go to school for this? What’s a good degree? I’m switching careers and am looking to become an event planner but I don’t know where to start. Wow! This was really educational! Pricing was a challenge to me – l am going to try these methods and take my business to another level. Thank you. My mom was a cordon blue and. an event planner but in Haiti. I wish to foyer foot steps but only the planning part because it gives me joy. i appreciate the tips on how to charge. Since I am starting, I don’t have venders yet. What is the best way to charge a client without being underpaid? Thank you for your information and help, you have given me. I’m sure l will put it in to practice. Wow. Very good information. !im coming across vendors that demand a referral fee of 20% Of the planners fee if they give the Lanier the referral. What’s the normal % rate? This has been very helpful in knowing what to charge. Great info. I have better insight into charges/pricing. This was extremely helpful. I have been planning for quite some time now through hospitality and other 3rd party companies, but recently decided to venture out on my own. I wasn’t sure where to even begin when it comes to what fees to charge. I am currently working on getting my own website up. If there are any other tips you can share on getting up and running, that would be awesome! Please reply via email. Thank you, and thanks for sharing this info! Very encouraging information. I surely look forward to start this particular business.